I saved the greatest art and literature dynasty in America, if not the world, from utter ruin! I did this while living on $750 dollars a month. This is the BIG STORY that needs to get out of the prison the very rich put it in. I am going to suggest to Karl Schwarzenberg that he assist me in making this Dynasty a part of the European Union. We creative people REFUSE to have our creativity swallowed up by a Greedy Egregious Liar, and, Grabby Hollywood Moguls, that includes Amazon. We Poor Bohemians and Hobbits are being dwarfed by uncreative souls – whose money makes money! We want Our World back! Fork it over, or we will take it back! Above is a photo of me in the Oakland Hills dressed as Strider. In 1976, my girlfriend made me that cape. Amazon is lost, has lost its way, in regards to Aragon. All they care about is getting us into a dark theatre and sucking the wallets out of our pockets. I know the way. I want my share, so I can be even – more creative! My great grandfather Wensel Anton Prescowitz came to America from Bohemia. Wensel is Wenceslas. The Knights under the Mountain, have been awoken and ride out of White Mountain to meet the army of Russian Trolls! I was dead. I was reborn. They cast my kindred out of their graves, and now………..
My dead, will show no mercy. We will take no prisoners! Who can blame us? Saint Wenceslas´s army is sleeping. It isn´t still time to wake them up. The time will come, when Czech people are in the biggest danger. On the top of the hill a dry oak will become green and the spring by a rock will run down the slope. A big battle will be in the landscape near Blaník. Czech people will defend against the strongest enemies. In that specific time Blaník will open and the knights will go to help Czech people. Saint Wenceslas will ride a white horse and he will be the commander. The enemy will be surrounded of sudden fear and will go to Prague, and there will be the end of the battle. The fight will be furious, blood will run from Strahov down to Charles bridge. And Saint Wenceslas on the white horse with a standard in his hand will expel all the enemies from our country. And Saint Prokop (our another patron saint), Sázava´s abbot with his staff, will help him. Then there will be saint peace and Czech country will have a rest. Malbeth the Seer prophesied that a day would come when need and haste would drive one of Isildur’s heirs to take the Paths of the Dead and that the Dead would answer to his call. Thousands of years later, in the final years of the Third Age, that prophecy was fulfilled. In the War of the Ring, Aragorn, Isildur’s heir and direct descendant, called upon the Dead, summoning them to the stone of Erech, and commanded them to fulfil their oath and be free. On this occasion, he first displays the royal banner of Gondor, made by Arwen and delivered to him by Halbarad and the Grey Company. On this day, let the Knight Templars of Rougemont pour out of the Arch of Washington Woodstock, and form a Rouge Line along 14th. Street, from river to river. Haters of Democracy……………You will not pass! We will crush the fake reports of Breitbart with real history. We will make America and England great again! Woodstock Manor was destroyed in the English Civil War (1642-51). But a description of it came into the hands of Sir Walter Scott, the great Scottish novelist, and he included it in his 1826 novel Woodstock or The Cavalier . Blenheim Palace was built on the site of the original hunting lodge and Rosamund’s Labyrinth, and was completed in 1724. It’s now a World Heritage Site, and one remarkable building. But perhaps as significant a break with the artistic past as the 1913 Armory Show was an event that occurred 90 years ago today in Washington Square Park. While 1917’s Declaration of Independence was soon forgotten, Greenwich Village’s spirit of rebellion and breaking with the past was very much alive, then and now. It is no understatement to declare that modern American art became deeply rooted in and around Washington Square in the decades after the Arch Conspirators’ stunt. Artists like Sloan and Glackens were the vanguard of an entire movement of realist painters, including Thomas Hart Benton and Edward Hopper, who painted around Washington Square. Other strains of art followed in Duchamp’s iconoclastic footsteps, most notably Jackson Pollock and other abstract expressionists. Gertrude Vanderbilt Whitney established the Whitney Museum of American Art in a studio a few blocks from the square, and sustained an entire generation of emerging artists by her encouragement and patronage. In more recent years, Washington Square continued to exert creative gravity for new generations of artists, writers, and performers — Bob Dylan, Joan Baez, Charlie Parker, and Allen Ginsberg all performed in and around the square. These days, the access door on the west pier of Washington Arch is locked, the spiral stairs secured, and the arch roof off limits. 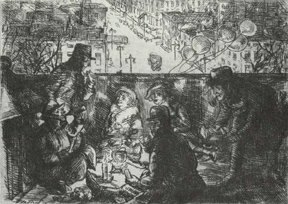 But on a chilly January night, 90 years after Sloan, Drick, Duchamp and the other Arch Conspirators proclaimed the independence of Washington Square, rebellion and artistic expression remain very much a part of the spirit of Greenwich Village. Duchamp’s contempt for conventionalism is reflected in his involvement with the “Arch Conspirators.” In January of 1917, Duchamp and a group of fellow artists (including poet Gertrude Drick; painter John Sloan; and Provincetown Playhouse actors Russell Mann, Betty Turner, and Charles Ellis) entered the inside of the Washington Square Arch’s staircase through an unlocked door, climbed to the top of the arch, and declared liberation for the “Free and Independent Republic of Washington Square” with the intent of having a neighborhood free from mainstream convention. The Daily Plant, the paper of the City’s Parks Department, wrote: “These six so-called ‘Arch Conspirators’ then spread out blankets, hung Chinese lanterns, tied red balloons to the arch’s parapet, sipped tea, shot off cap pistols, and conversed until dawn.” (Read more about the Arch Conspiracy here). Singer Castle, built for the Singer Sewing Company’s president Frank Bourne in 1902, was modelled on Sir Walter Scott’s description of the place where Henry II’s mistress, Fair Rosamund, was imprisoned in the 12th century. A MEDIEVAL mystery echoes down the centuries and across an ocean to the halls of a faux castle on this island in the St. Lawrence River. The mystery: what happened to Fair Rosamund, the beautiful young mistress of King Henry II (1133-1189) of England? Was she murdered by his jealous queen, Eleanor of Aquataine? Or did she live out her later years anonymously, in a convent? 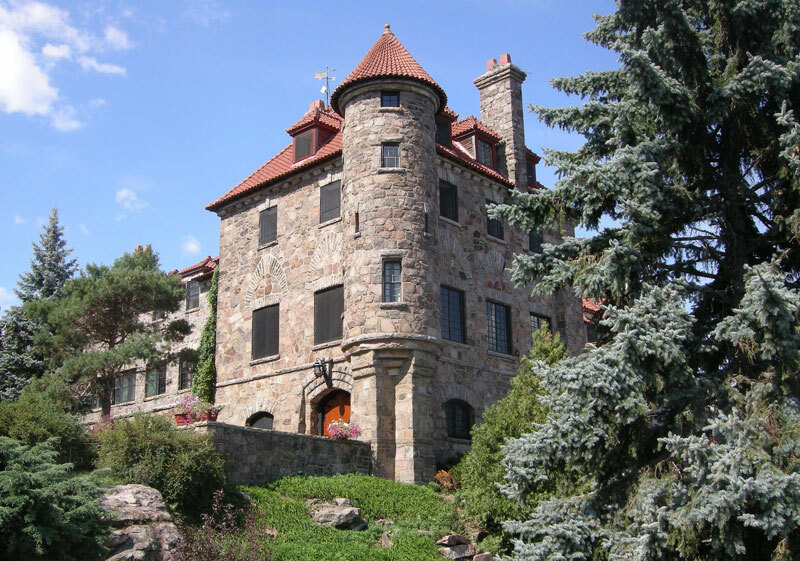 It’s a riddle you can ponder as you walk the corridors and gardens, study the ancient weapons and suits of armour, and peer into the secret passages of Singer Castle, here on Dark Island, a few hundred metres south of the Canada-U.S. border in the St. Lawrence. (Belying its name, Dark Island is a pleasant place, not in the least eerie or brooding.) Or, if you want to pay $725, you and your lover can ponder in the bridal suite, which may be a replica of Rosamund’s bedchamber. It was there that, sometime around 1160, Henry sequestered Rosamund de Clifford, the woman who has gone down in English folklore as Fair Rosamund. Serious historians reject the story. They say Rosamund died in a nunnery, where she had fled to atone for her adultery with the king. Some say Henry “leaked” the murder story to blacken Eleanor, whom he had grown to hate. Fast forward to 1902. It was the Gilded Age for America’s industrialists and tycoons and Frank Bourne, president of the Singer Sewing Company, wanted a summer “cottage” on his three-hectare Dark Island. 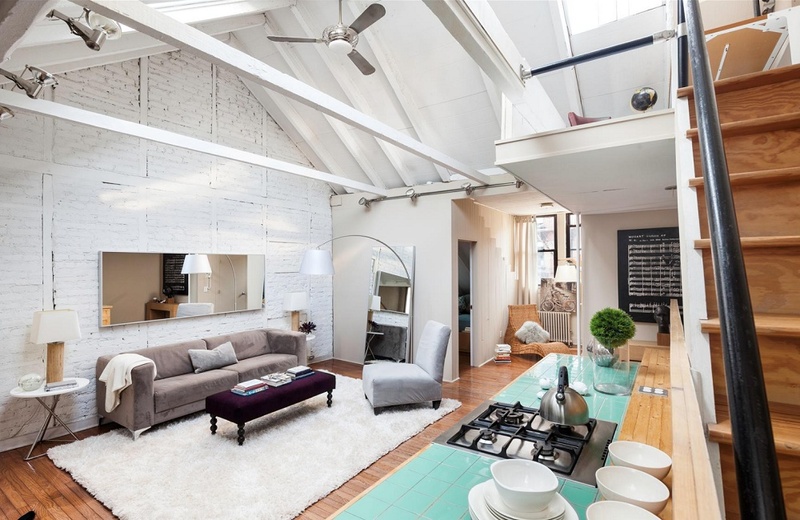 He commissioned architect Ernest Flagg, who had designed the Singer Building in New York. Flagg was a fan of Sir Walter so, switching his talents from skyscrapers to castles, he modelled Flagg’s summer home on the novelist’s description, red-topped turrets, a dungeon, tunnels and all. The cost: $500,000, a fortune in those days. Singer Castle remained a private residence until 2003, when the present owners opened it to public tours. Among the books in its library is a first edition of Scott’s Woodstock . I am trying to SAVE YOU! You fight me all……….THE WAY!…….Why?